Its that time of year again, so please feel free to share the following seasonal memes across social media for the attention of those in the Senedd with the power and influence to make a change. The #SaveWILG campaign is very disappointed that the Petitions Committee failed to move towards writing a report on the petition to reconsider the closure of the Welsh Independent Living Grant. Urgent action is required now as people continue to struggle as I know only too well. Last night I was awake from 03:00 onwards as I needed to use the urinal, could not grab the paracetamol that I needed to ease the pain in my legs and I had to struggle to get my phone that had slid under my back during a restless sleep. All these problems would have been easily prevented if I had adequate 24/7 care to allow me to live independently in the community like I deserve. The Petitions Committee – who have been supportive so far – need to remember that there are over 1000 disabled people struggling throughout Wales who are dependant on them taking quick and decisive action. If you have any queries – contact me. ask whether, as a middle way between ring-fencing and funding through the Revenue Support Grant, he will consider requiring local authorities to provide a report detailing actual expenditure on care packages for previous recipients of the Welsh Independent Living Grant, including the number of recipients, the average amount received per person and the total amount awarded. We are hoping that the Petitions Committee will reach a positive conclusion over our petition to save the Welsh Independent Living Grant when they meet next Tuesday (23 October). My petition was first heard over a year ago and I have since been locked in correspondence with the committee, compiled and even visited the Senedd to give evidence on why we need to #SaveWILG. Once again, I have provided extensive evidence and have been backed up by fellow activists and even – to a point – Local Authorities. Fingers crossed for a positive outcome on Tuesday. Your petition will be considered at our next meeting on Tuesday 23 October at 9.30am. Below I have copied a letter from David J Rowlands, AM, Chair of the Petitions Committee. That should be of interest to all WILG recipients and their families. 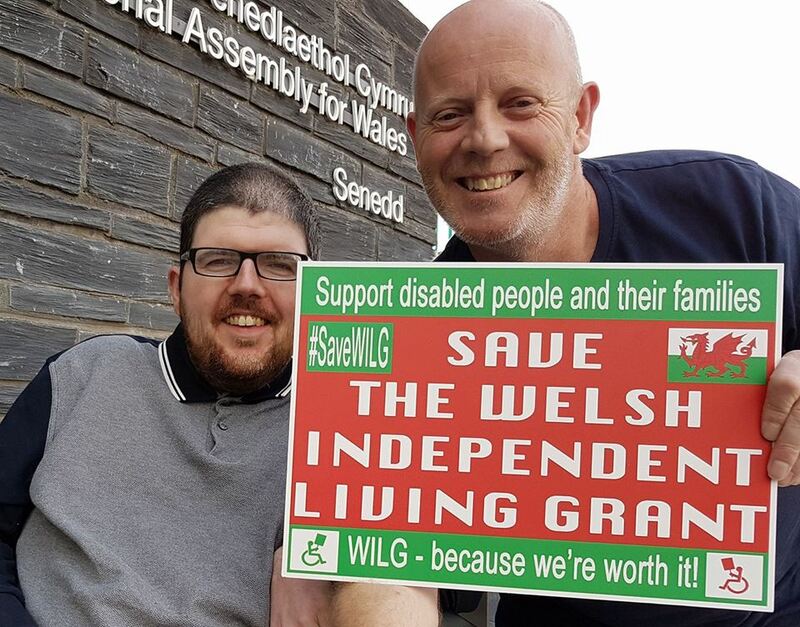 I am a recipient of the Welsh Independent Living Grant (WILG) and a disability activist who intends on asking Welsh Government to reconsider their decision to close WILG as of April 2019. The WILG was introduced to help people who previously claimed from the UK government’s Independent Living Fund (ILF), which closed in 2015. More than 1,500 people are helped by the scheme across Wales. Recipients all have high degree of care and support needs. It was due to run until the end of March 2017, but Social Services Minister Rebecca Evans said in November that funding would continue for another year. The annual £27m fund will then transfer directly to local authorities during 2018-19 so they can meet the support needs of all former ILF recipients by 31 March 2019. The Welsh Government said the decision was taken on stakeholder advice. The majority of representatives on the stakeholder group were third sector or citizens. But they didn’t want WILG scrapped and the key point is that our advice was not accepted. It should also be remembered that closure of WILG is not inevitable as is proved through the formation and success of the Scottish Independent Living Fund; which also works to support the Northern Ireland ILF. Furthermore, the hugely popular Labour Party Manifesto outlined plans to set up a national care system to exist independently of local authorities. This is exactly the time that the Labour Party should be united on such issues against the Tories. We must question why Welsh Labour are not playing their part in the changing political landscape? Indeed, eventually it should be our aim to set up an Independent Living Fund for Wales so that no disabled person should have to suffer the same uncertainty and isolation as WILG recipients are now experiencing. We can only begin to believe that true social justice and equality for all is possible if Welsh Labour revisit their WILG decision. Welsh Labour will no doubt argue that we should give the Social Services and Well-being (Wales) Act a chance to succeed. However, this idealistic act needs hefty investment and resources to ensure it is a success – with no sign of any of the necessary improvements to our infrastructure that the success of the Act depends on. This may indeed be the time for a revolutionary change in the way social care is delivered, but such a transformation could take a decade or more and WILG recipients do not deserve to be treated like guinea pigs when their high care and support needs require long-term stability and structure. The Committee has agreed to seek the views of others who may have a perspective on the petition and the decision to close the Welsh Independent Living Grant from March 2019. The Welsh Government’s decision to transfer funding for the Welsh Independent Living Grant to local authorities. The potential benefits or problems which may arise from supporting WILG recipients through local authority social care provision in the future. The current transition process, including assessment by local authorities, and any feedback from WILG recipients. If you (or your organisation) was involved in the work of the ILF stakeholder advisory group, your experience of this process and the extent to which the group’s deliberations and final recommendation reflected the views of members. Any alternative approaches that you believe should have been taken by the Welsh Government, or any changes which should be made at this stage. Any other views or comments that you have in relation to the petition. I would be grateful if you could provide any response which you wish to make by e-mail to the clerking team at SeneddPetitions@assembly.wales, if possible by Friday 14 September 2018. Please feel free to share this letter with others who you feel would have views to share on any of the above. Responses are typically published as part of our Committee papers and will be discussed at a future Committee meeting.